Is your child a huge Harry Potter fan? 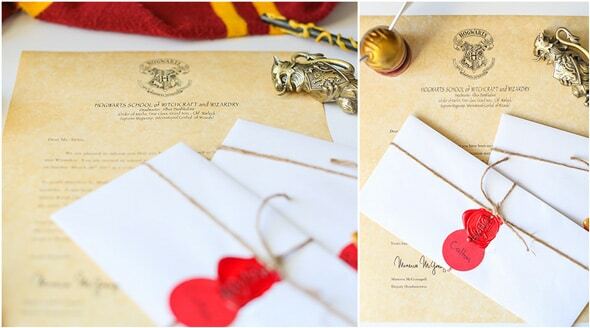 If so, get ready to be blown away with this magical Harry Potter party! 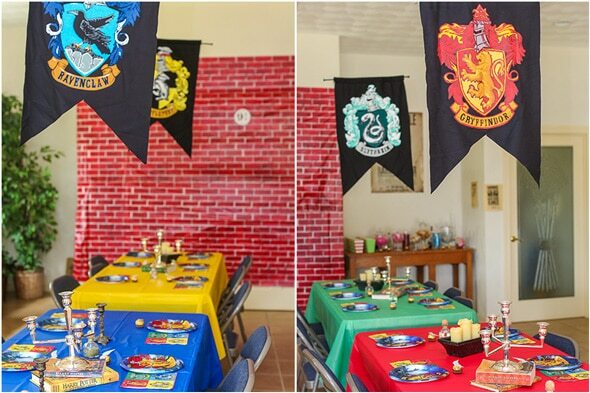 We don’t know many little boys (or girls) who wouldn’t die to have a Harry Potter Themed Party like this one! 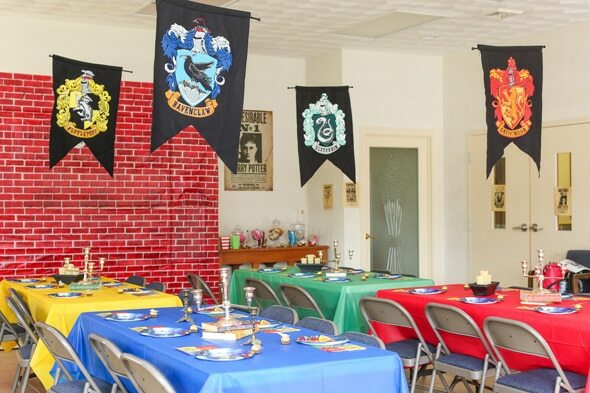 Mom really went all out to transform this venue into the ultimate Harry Potter Party for her son’s birthday. 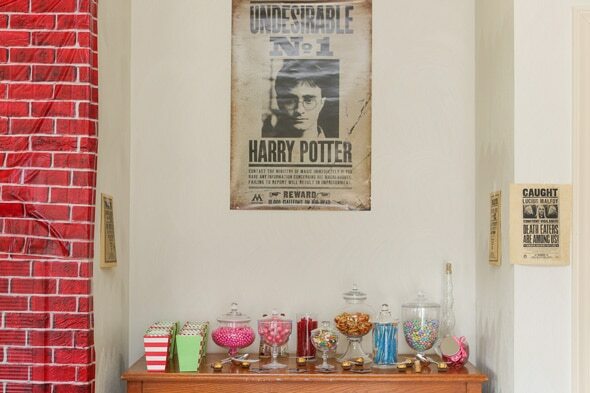 If you’re wondering how to throw a Harry Potter Party, look no further than this one. Every detail from the AMAZING birthday cake and party invitations to the backdrop and decorations were picture-perfect! And if you’re wondering what to wear to a Harry Potter Party, make a DIY costume or throw on a black sweater or suit jacket and a scarf or tie for some birthday fun with friends! 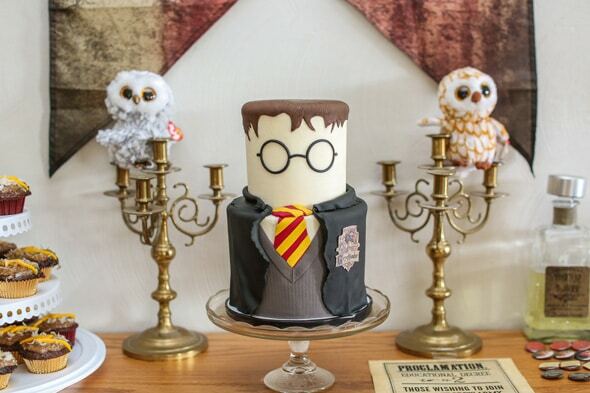 When throwing a Harry Potter party be sure to remember a few things: setting the tone with an amazing invitation and go all out on the cake, which should be the centerpiece of your dessert table. 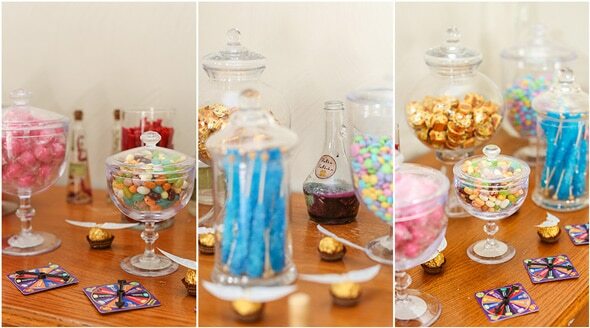 Another tip is to always have an eye-catching dessert table backdrop. This party checks all of those boxes, so let’s dig into the amazing party details. Fresh Look Photography had a lot of fun bringing together all of the elements to create this wizarding world. The venue, New Creation Community, was transformed into Hogwarts seamlessly. 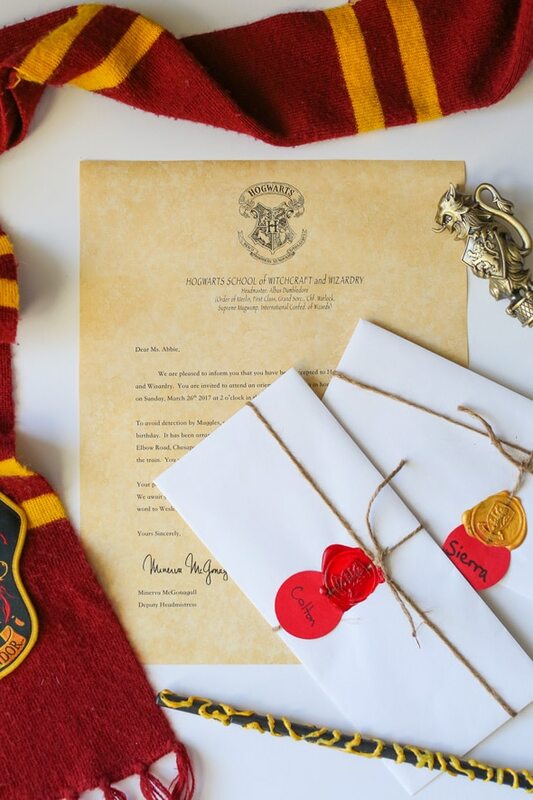 We absolutely love how the tone was set with these party invitations, which were Hogwarts School of Witchcraft and Wizardry letters!!! We’re sure every guest was excited to receive one of these letters! 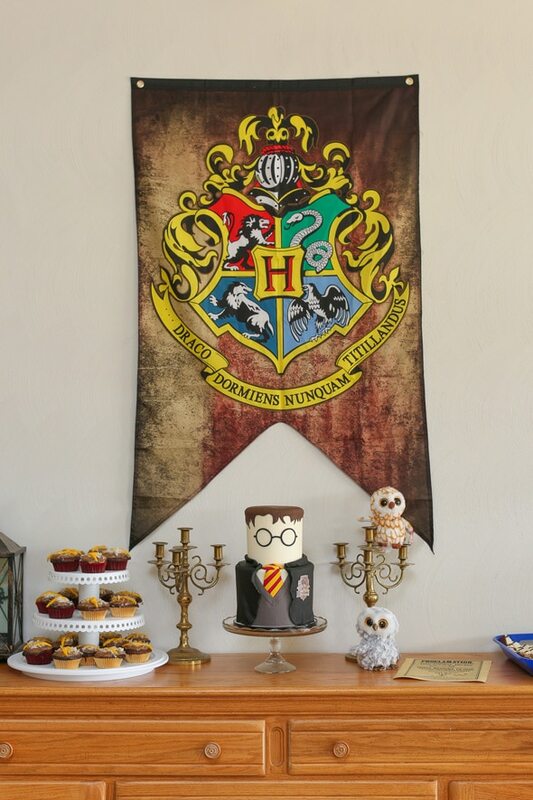 The different house banners were a great way to bring the party theme together. Everyone was assigned to a respective house, with the birthday boy being a part of Gryffindor, of course! The colors, flags and decor really brought this theme to life at the party venue. 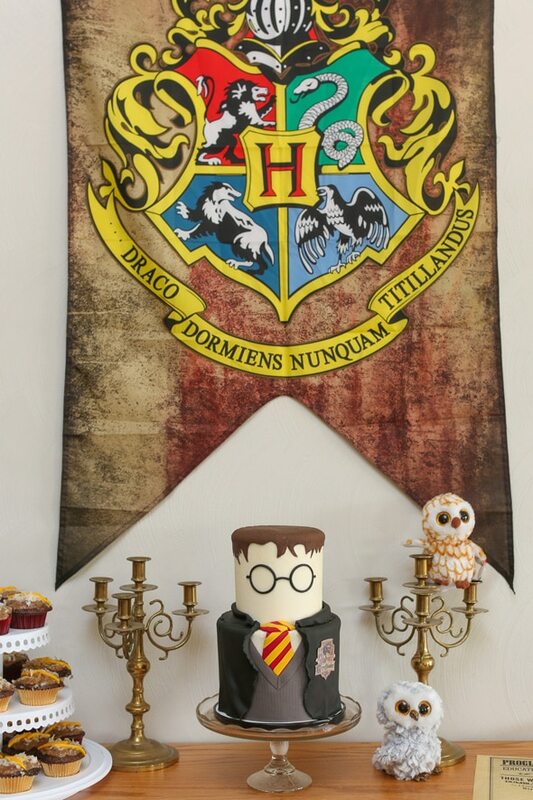 We love these Harry Potter Party Supplies and Decorations! 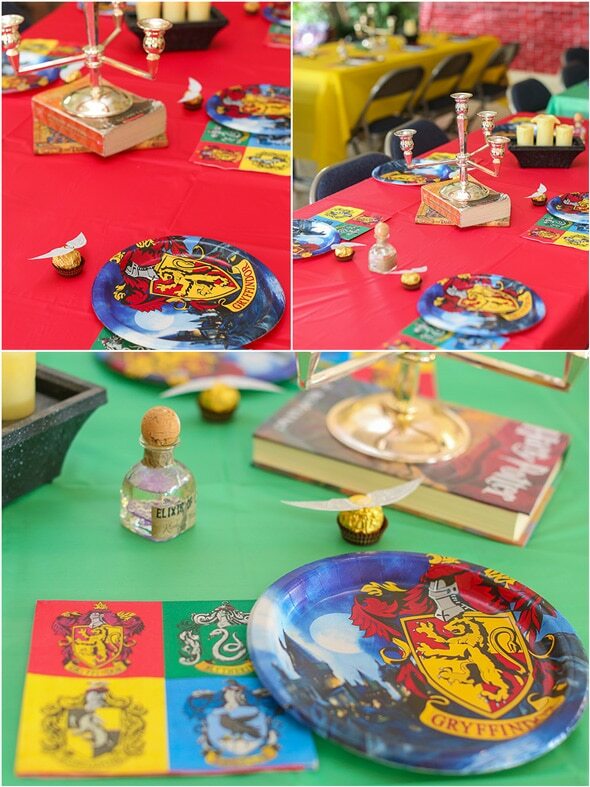 The party tables included Harry Potter books, golden snitches, and more! 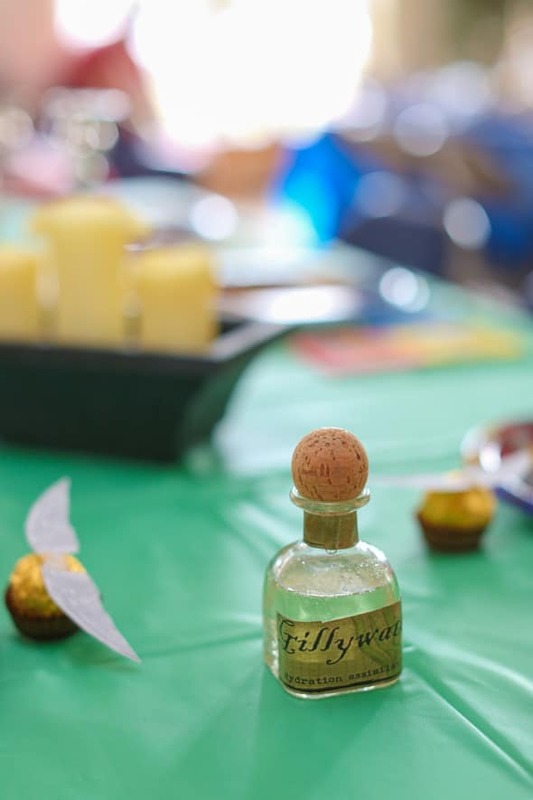 We love the thought and planning that went into decorating this Harry Potter Party! One of our favorite details from this party is the Harry Potter birthday cake, created by Whipped Up By Mimi. What an adorable creation that would definitely make Harry proud! 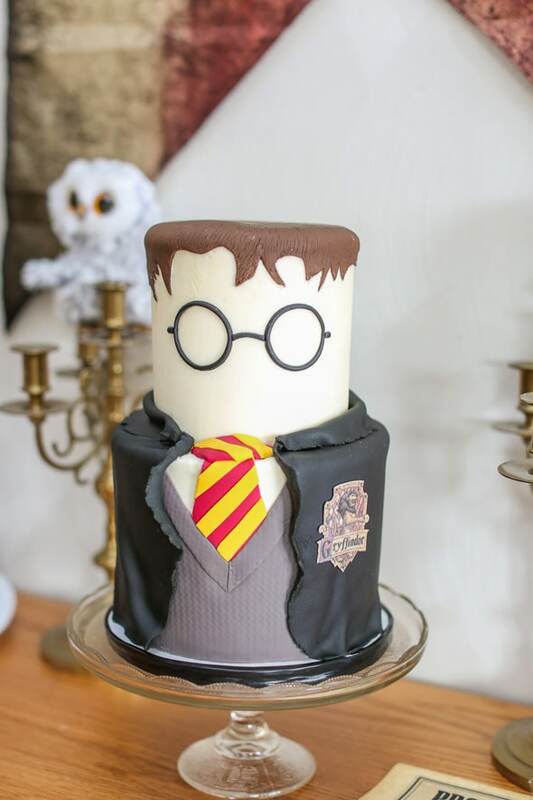 The design is darling and any Harry Potter fan would go absolutely crazy over this cake for their birthday! Have a sweet tooth? No problem! A candy table was available for the party goers, too. Everyone had a special bag to fill up and with all of these goodies. You wouldn’t have to ask these kids twice! 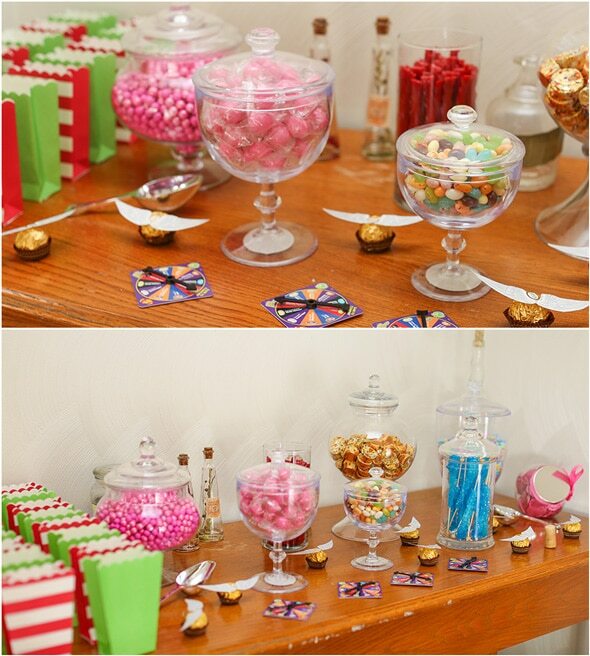 Having a candy buffet doubles as great party favors, as well. All of the details from the Harry Potter series were available, like Platform 9 3/4, the golden snitches and many other elements! This magical world came to life and made the party feel so authentic! Each “wizard” got to choose their own wand at Ollivanders Wand Shop and were able to exchange money at Gringotts Bank. How fun! All of the wands were found at Oriental Trading. 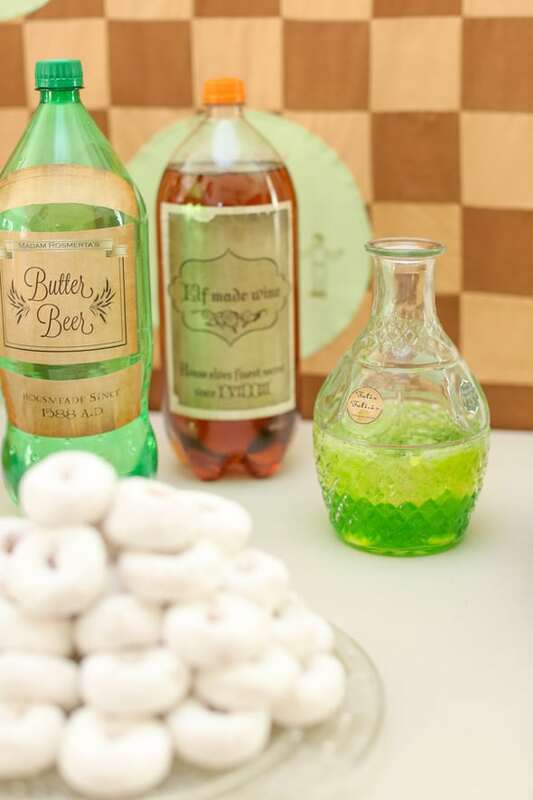 There was even “butter beer” with powdered sugar donuts! So fun! Those drink labels really add that special touch to the party decor! We’re certain all of the kids went home talking about this Harry Potter Party for weeks! You don’t get much better than this amazing Harry Potter Themed Party! What a lucky little wizard! 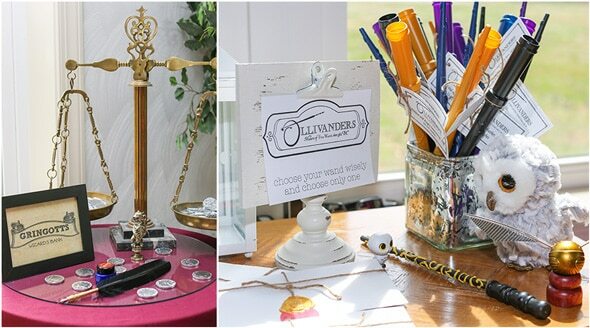 Any Harry Potter fan would absolutely love this party as inspiration for their own birthday celebration! 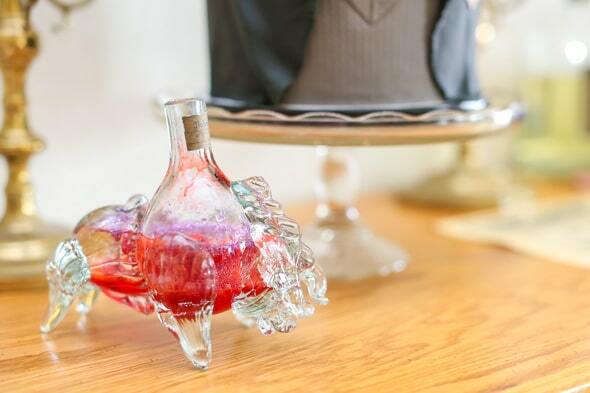 Do you have a favorite detail from this Harry Potter Themed Party? Let us know in the comments below! For more party ideas, follow us on Instagram @prettymyparty and Pinterest and join us in our private Facebook group.